It’s simple. Emergency response personnel have been advising us to do it for a while now. Add a contact record to your phone with the name ICE which in their case stands for In Case of Emergency. In the note section of the contact, put your name, blood type and list any medical conditions that you might have plus any medications you are taking or the name of your physician. 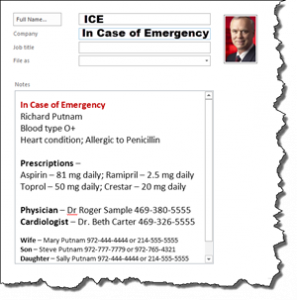 You also need to list emergency contact people and their contact info. The use of ICE originated several years ago when a British emergency responder came up with the idea. Upon responding to a call and finding a victim that was unable to communicate, he went through the victim’s wallet looking for someone to notify. The fireman also tried the cell phone with no luck. The fireman then came up with the idea of adding a contact with ICE to the phone where emergency contacts and info about the victim could be kept. This story got a lot of publicity, and spread over to the U.S. and other countries. This special contact record is not yet recognized everywhere, but it’s getting there. The short amount of time spent adding the info to your phone contact record more than justifies time spent for an emergency responder to look for it. If you don’t want to put it in your phone, create a paper version to carry in your wallet or purse. One of these could make a big difference in saving your life. Looking for Fairfax homes for sale that are close to hospitals or fire stations? I can help. I can create a custom search that will send you homes located close to any of these locations. Just ask!